As regular readers are well aware, Uni Watch's knowledge of soccer is, shall we say, a bit limited. But with the World Cup kicking off Friday, there's no more avoiding the issue. So here's what many of you have long been requesting: the first Uni Watch column devoted to the sport that inspires long naps in America and stadium riots everywhere else. Now, Uni Watch is an adept enough Googler to come up with plenty of historical photos and uniform galleries, along with informative articles such as this one. But at the end of the day, Uni Watch could use a little help putting it all in perspective. That's where reader Dave Dixon comes in. In an inspiring effort of herculean proportions, he generously has whipped up an assessment of all 32 World Cup teams, often with historical background. Here's his country-by-country rundown, in rough order of team prominence, supplemented by Uni Watch's admittedly unschooled attempts at soccer commentary. Notice the fluid stripe on the classic U.S. outfit. Dixon says: This year's design is a throwback of sorts, a tribute to America's soccer history (specifically 1950, when the U.S. beat England in the World Cup). The stripe on the jersey is vertical instead of diagonal, but it's still a very traditional look. The shorts feature the same stripe, but it's on the side panel, so it doesn't line up with the jersey stripe. The socks also feature this stripe, but only on one sock, and off to the side (which I think looks kind of cool). As for the alternate uniform, the colors are reversed and the stripe is horizontal. 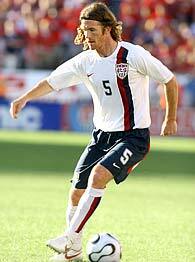 Just for reference, here are the 2002 World Cup uniforms -- not bad, but not great, either. For the past year or two, they've been wearing jerseys with front bibs and contrast-color nameplates. 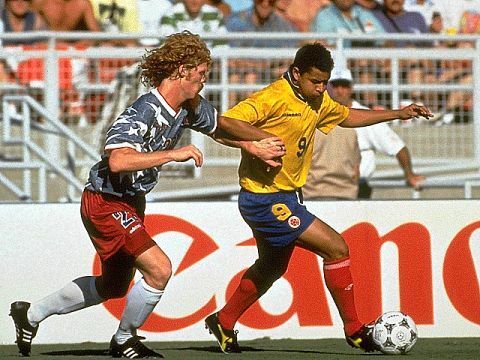 But it could have been (and was) worse, as it was in the 1994 World Cup, held in the U.S., when the national team wore star-adorned monstrosities. Uni Watch says: Pretty classy look, but that one striped sock is going to make us a global laughingstock. Dixon says: Brazil's primary uniforms this year, as always, feature yellow jerseys, blue shorts and white socks, and the alternates feature blue jerseys, white shorts and blue socks. 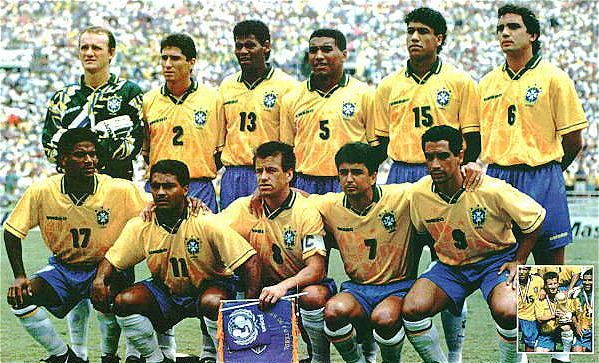 It's all pretty plain, especially compared with what Brazil's jerseys have looked like the past few years (primary, alternate, contrast-color nameplate) and in the 1998 World Cup. Uni Watch says: Plain, shmain -- this design rules. Dig that stand-up collar! Dixon says: Arguably the best example of a team's uniform changing every year yet remaining the same. As usual, Argentina's standard uniform features a sky blue-and-white vertically striped jersey, black shorts and white socks. The jerseys feature one of the three templates adidas is using this year, identifiable by the wavy line along the torso, separating the jersey's striped and nonstriped areas. For future reference, let's call this adidas-A. Oddly enough, the jersey for Argentina's alternate uniform features one of adidas' other templates, characterized by several crescent-shaped panels in place of the solid wavy line (we can call this adidas-B). Anyway, this jersey, as usual, is navy blue with sky blue accents, and it is paired with white shorts. Uni Watch says: It's nice that the jersey stripes mimic the Argentine flag, but couldn't they have incorporated that cool sun-face graphic too? 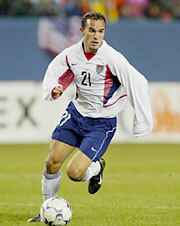 Dixon says: One of the few remaining national teams with uniforms made by Umbro. 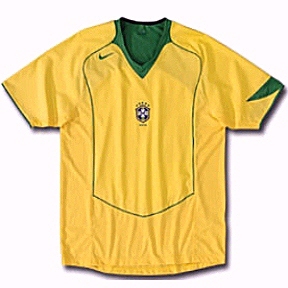 This year's design is sort of stylized, and the jersey features a shoulder cross, which is a reference to the English flag (not to be confused with the British flag -- an important point, since England, Scotland, Wales and Northern Ireland are separate teams in international soccer, as opposed to the Olympics, where Great Britain competes). The shorts have accents that match the jersey, as do the socks. The alternate uniform features a red jersey, white shorts and red socks. Uni Watch says: How do you say, "Zzzzzzzzz" with an English accent? Dixon says: Germany always seems to be adidas' banner team, which is no surprise as adidas is a German company. But Germany's uniforms this year are less distinctive than in the past. The jersey is cut to the adidas-B template, with these shorts. Compare that with what the Germans were wearing last year (primary, alternate) and in the World Cup in 2002 (primary, alternate), 1994, and 1990. Uni Watch says: You can't fully appreciate how awful those shorts are until you see them in action. Dixon says: Here we have one of the handful of teams with a standard jersey color that isn't found in the country's flag. The orange jersey is paired with white shorts and blue socks, a color scheme apparently inspired by this flag, known as "the Prince's flag," which was used by rebels headed by the Prince of Orange in their war for independence in the 16th and 17th centuries. 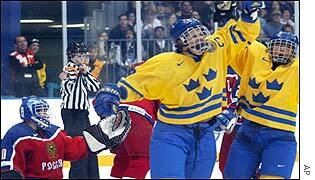 The national flag is reflected in the alternate jersey, which also mimics those 1950 U.S. jerseys a bit. 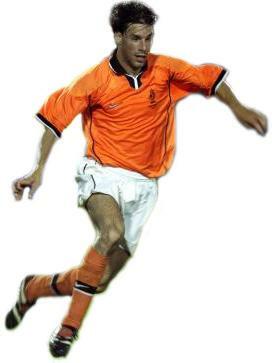 To put this all in historical context, here's the jersey from 2002, when the Dutch missed qualifying for the World Cup, and here's their 1998 World Cup uniform. I think this is from 1994. And here's something really old-school, modeled by Ruud Gullit, whose name was on a pair of soccer shoes I had in middle school. Also worth noting: The Netherlands has one of the coolest team badges. Uni Watch says: Love the historical connection to the Prince's flag, but there's something about an orange jersey that just doesn't work. Alternates look sharp, though. Meanwhile: Why do the uni numbers look as if they've been applied with electrical tape? Dixon says: Italy's flag is red, white and green. But the Italian soccer jerseys have always been blue -- hence the nickname "Azzurri" -- because blue was the color of the old Italian royal family, the House of Savoy. Italy's uniforms barely change from year to year -- the revisions are almost always minor details. This year's jersey is fairly plain, with just some curvilinear detailing near the sleeves, with similar detailing for the shorts, creating a simple, basic look. The alternate jersey features a faux V-neck, and the shorts have some subtle piping along the sides. In the last version, the gold Puma logo was actually furry, but I'm not sure whether this year's model has that feature. Looking back, this was the 2002 World Cup edition, which was made of a sort of form-fitting spandex material, and here's a shot from the 1994 World Cup -- as I said, they don't change very much. Uni Watch says: Everyone knows the real reason Italy's flag is red, white and green is that those are the colors of a classic pizza margherita. What are we supposed to do now, eat blue pizza? Get with the program, Italy! Dixon says: France's uniforms usually reflect the country's flag, and this year is no different. The jersey is in the adidas-B template, and here are the shorts. The alternate jersey is also adidas-B, but it has that weird gradation stretched across the front and goes with these shorts. To get a sense of France's uni evolution, here's what the French wore for the 2002 World Cup, with this as the alternate, and these are from the 1998 World Cup. Uni Watch says: Love the striped socks. But what's with the huge player-name typography? Dixon says: Spain's uniform features an adidas-A jersey (although the wavy torso outlining is a bit narrower) and these shorts. The Spanish have an adidas-B alternate, which pairs with these shorts for a white-on-white look. Here are the most recent uniforms before this year, and you also can see what they wore a few years ago and in the 2002 and 1994 World Cups. Uni Watch says: Jersey looks a bit too stripy when you see it up close, but the effect is more subtle from a distance. Dixon says: The primary and alternate looks are simple and fairly traditional. In a classy historical touch, the double-outlined uniform numbers (front and back) are a direct reference to the typeface created for the 1968 Olympics in Mexico City. As for more recent history, the uniforms from the past few years were like other Nike uniforms, complete with contrast-color nameplates. 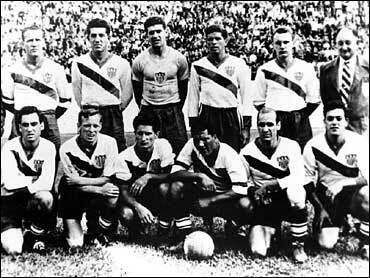 Before the team was supplied by Nike, it used Atletica, a Mexican company that made uniforms like this and this. Uni Watch says: Instant classic. And check out the cool Aztec-inspired underweave pattern on the main jersey stripe. The pick of the litter, as long as they avoid going green-on-green. Dixon says: Portugal is one of the major teams Nike markets now, but it had a long spell of missing the World Cup and wasn't a popular team worldwide until shortly before the 2002 World Cup. The primary jersey and shorts are both burgundy, creating a solid-color look (in the past, the shorts have been green), and the alternate uniform is also solid because the jersey and shorts are both black. Uni Watch says: Big mistake to ditch the green shorts. But the green-trimmed socks are wicked cool, and the all-black alt outfit looks aces. 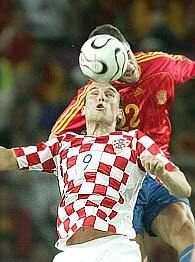 Croatia's jersey interestingly resembles a picnic tablecloth. Uni Watch says: This is where we make all the obvious jokes about the Tour de France and Italian restaurants, right? 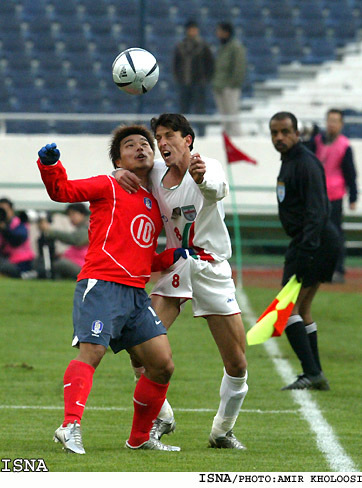 Dixon says: Japan, like Italy, traditionally uses blue for its standard jerseys, even though its flag is red and white. This year's jersey is in the adidas-B style, with some added graphic accents next to the crescents. The alternate is an adidas-A. Uni Watch says: Why do the shorts have red when there's no red in the jersey? Why do this guy and this guy have their names printed so much larger than everyone else's? And what are they thinking about with that alternate jersey? Back to the drawing board, people. Dixon says: South Korea's jerseys are sort of a tomato red/orange. The team has worn blue shorts in the past, but has been wearing white and red this year. The alternate uniform reverses the colors. Uni Watch says: The solid red look makes the team look like a bunch of giant blood clots, so let's hope the South Koreans stick to the white shorts. But here's the bigger question: How can a country with a flag that features so many cool graphic symbols have such a boring uni? Dixon says: One of a slew of teams that will wear essentially the same Puma uniform, with no real differences other than the team's badge and colors. Poland's version features a white jersey with a winged-horse underweave pattern and a red alternate. Uni Watch says: Very cool rear-jersey typography. The under-pattern is kind of a red herring because you can't see it in photos or on TV. Dixon says: Sweden's Umbro uniforms are very similar to England's (standard, alternate), presumably because the cross on the shoulder evokes the Swedish flag. Uni Watch says: Very nice, but how cool would it be if the soccer team did something like the Swedish national hockey team? Dixon says: Another Puma team -- here's the front, back and alternate. Uni Watch says: Far be it from Uni Watch to criticize any team wearing striped socks, but what's with the blue hose? Dixon says: Yet another Puma look-alike team -- front, back and alternate. Uni Watch says: Another team that needs to avoid the bloodbath look. Red-over-white looks solid, though, and dig the socks! Dixon says: Ecuador will be wearing a yellow jersey with blue shorts and red socks (mirroring the country's national flag) and a white alternate. Uni Watch says: The mismatched sleeves are bad news -- shades of Virginia Tech. Dixon says: Paraguay traditionally wears red and white stripes, and this year's design combines that motif with the current Puma template (front, back). The alternates are much less distinctive. Uni Watch says: Seems odd to have the stripes on the front but not on the back, no? Dixon says: Costa Rica will wear a red jersey (here's a closer look), with a striped alternate (ditto) and a white third jersey. Uni Watch says: Uni Watch has never understood the paint-smear school of design. Like, is Jackson Pollock really popular in Costa Rica or what? Save the acrylic drizzles for the art gallery and give your uni some real graphics. Dixon says: This red jersey is the adidas-C template. 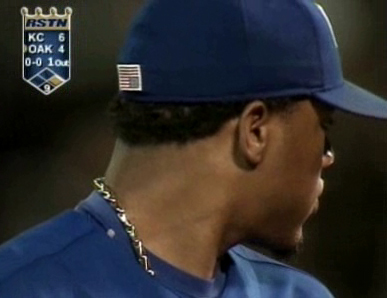 Uni Watch says: The asymmetry produces a surprisingly good feeling of flow -- nice. But what's up with the sock stripes? Compare these guys, these guys, this guy and this guy. Could we please have a little consistency here? If you get close enough, you can see the Puma mark of a beast. Dixon says: Like all the African teams in this year's World Cup, Ivory Coast will wear the Puma template, rendered in orange for the Ivory Coasters. Uni Watch says: Poor Dixon's clearly running out of steam (and who can blame him? 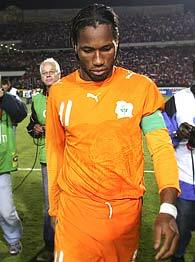 ), so Uni Watch is gonna step into the breach here because these Ivory Coast unis are the bomb. Yes, Uni Watch just got done slamming orange jerseys a few countries back, but there's something about all the green trim that ties this beauty together (plus the Netherlands' orange jersey doesn't have a nifty underlying elephant). And check out the alternate and third designs -- awesome. Even this team's fan club looks cool. Dixon says: Another Puma design, this time rendered in yellow. Uni Watch says: Got citrus? The primary uni is pure lemon, and the alternate is the very essence of lime. The two flavors merge on the team's shoes. If there's any justice, this team's games will all end in 7-7 ties -- 7Up! Dixon says: Still another Puma-outfitted team, but with a difference: The jersey has stripes, as do the shorts. The alternate features a striped white-on-white design. Uni Watch says: Very solid, especially the alternates. Dixon says: Back to Puma's basic template, this time in white. Uni Watch says: Um, what is this, a white T-shirt? Yup. The socks help a little, but mainly it just looks as though these guys all shopped at the Gap. Dixon says: Puma in white yet again, with a solid red alternate. Uni Watch says: Snooze-o-rama. 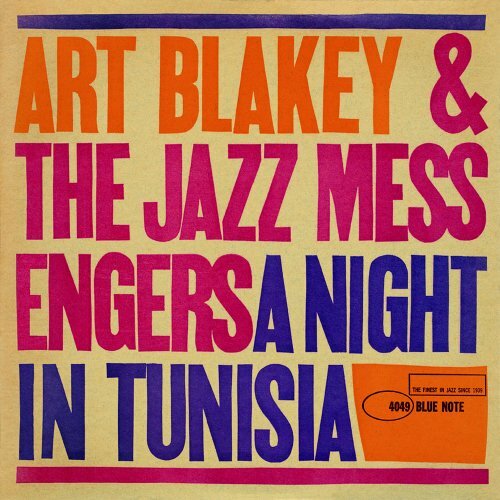 Uni Watch will never be able to listen to "A Night in Tunisia" the same way again. Uni Watch says: The red and green detailing provides just enough visual interest to rescue this one from the J. Crew clearance sale. But watch out for those solid red alternates. Dixon says: Another team with uniform colors that have no connection to the country's flag. The jerseys are yellow, with green shorts and yellow socks, and the Aussies have a navy-on-navy alternate. Uni Watch says: Simple rule: Any uniform with a kangaroo on it is automatically cool. Dixon says: Last of the Puma teams, again in white. The overall look is very similar to Iran's, but the alternate is solid green. Uni Watch says: With exhaustion setting in, Uni Watch has only enough energy to cast an admiring eye toward the coach's sweatshirt. Dixon says: A goalkeeper's jersey must be a different color from his teammates', and it's supposed to be a different color from the other team's jerseys. as well. It used to be that goalkeepers would wear the same shorts and socks as the rest of the team, but now they usually have their own. Many of the goalkeeper jerseys have the same basic design template as the other players' jerseys, just executed in different colors -- that's the case with, for example, Germany (players, goalkeeper). Others are more distinct but are still in the same basic design family, such as Spain's (players, keeper). That's a big difference from the way things used to be, when goalkeepers' uniforms were totally different from those of the rest of the team, culminating in the custom-made uniforms of Mexican goalkeeper Jorge Campos. Uni Watch says: Nothing to add here, except that anyone who has read this far really ought to send a note of thanks to Dave Dixon, without whom you probably would have been reading about baseball pants pockets (don't laugh -- you'll still end up reading about that, it'll just be two weeks from now). If there are any errors in the preceding rundown, they're almost certainly Uni Watch's fault, not Dixon's, so don't give him a hard time (well, except maybe for coming out in favor of that one striped sock on the American uni). Here's to you, Dave -- next round's on Uni Watch. Last column's survey of NFL uni numbers brought some great feedback, the best of which involved the number zero. As you might recall, Uni Watch identified two players who had worn double-zero -- Jim Otto and Ken Burrough -- but wasn't aware of any who'd worn the single goose egg. That prompted Jack Rivera to check in with the story of Obert Logan, who played for the Saints in the late 1960s. 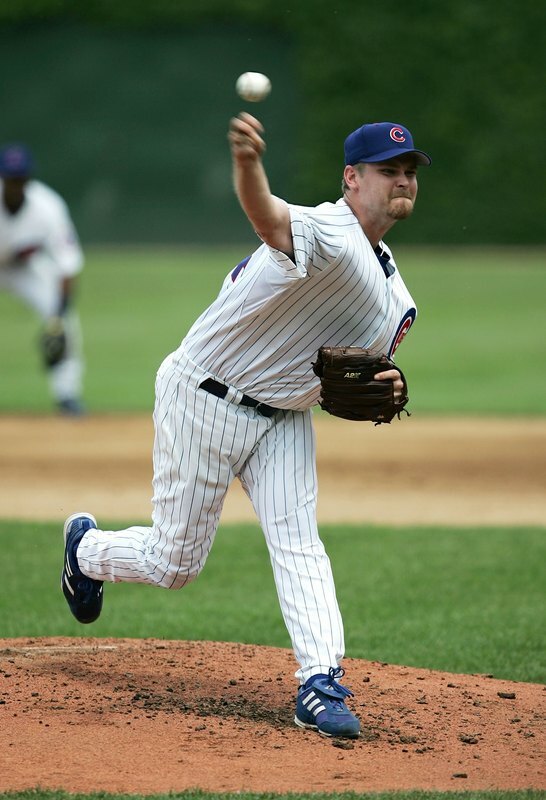 "He started for quite some time, and was a pretty big fan favorite," Rivera writes. "I remember the broadcast announcers almost never failed to mention that he had to get special permission just to wear a single-digit jersey whenever his name came up." Several readers also pointed out something Uni Watch hadn't been aware of: Bryan Cox wore single-zero for a preseason game in 2001. But he switched to No. 51 for the regular season. Still more zero-related news: Browns center LeCharles Bentley's request to wear double-zero, in honor of Otto, officially was turned down by the league. He'll be wearing No. 57 instead. Moving up one notch from 0 to 1, several readers pointed to the unusual case of Browns wide receiver Michael Jackson, who initially wore No. 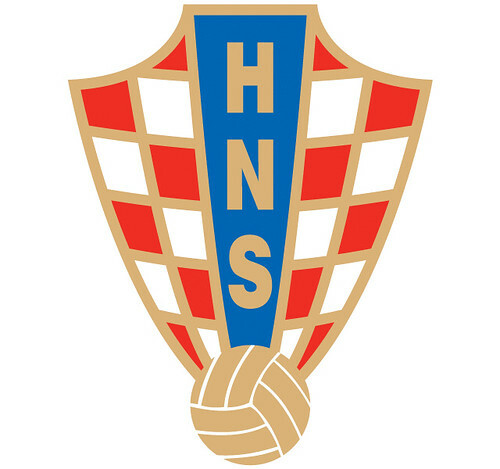 1, then was forced by the league to change to No. 81 (about the same time he changed his surname from Jackson to Dyson, which made the situation a bit more confusing). For full details, go to this page and scroll down to post No. 87. More No. 1 arcana: Uni Watch mentioned that you rarely see quarterbacks wearing No. 1 and that the most prominent example was Warren Moon. Big thanks to the many readers who pointed to three QBs who were known better for other numbers but wore the ace for brief periods in their careers: Jeff George, Randall Cunningham and Don Majkowski. Wondering what happened to the Uni Watch News Ticker? It's now running every weekday, along with lots of other material, at the new Uni Watch blog, where recent topics of discussion have included Ambiorix Burgos' upside-down flag patch, catchers who get their fingernails painted white (and sometimes their fingers, too), the annoying stretch gussets on MLB's new Cool Base jerseys, and some wicked women's lacrosse eyewear. The blog is intended to supplement the Page 2 column, not replace it, so Uni Watch hopes to see you every day over at the new site as well as back here in two weeks. Paul Lukas happily notes that the World Cup is purple-free. His answers to Frequently Asked Questions are here, and archives of his "Uni Watch" columns are available here, here and here. Got feedback for him, or want to be added to his mailing list so you'll always know when a new column has been posted? Contact him here.